Gaston's Jr./Sr. 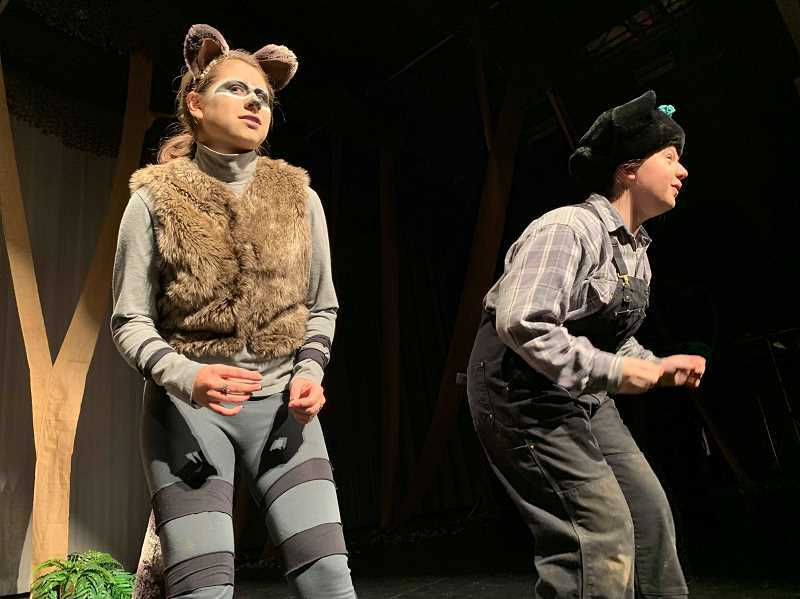 High School produces play about forest animals, written by senior Abby Oliver. At age 18, Gaston High School senior Abby Oliver is already a playwright, with her play "The Animal Parliament" debuting on her school's brand-new stage this holiday season. Her first work tackles the trials of a group of forest animals dealing with hunters and explores themes like standing up for yourself. The newly constructed stage at Gaston High in southwestern Washington County debuted earlier this year, and is decorated with trees imitating a dense forest. 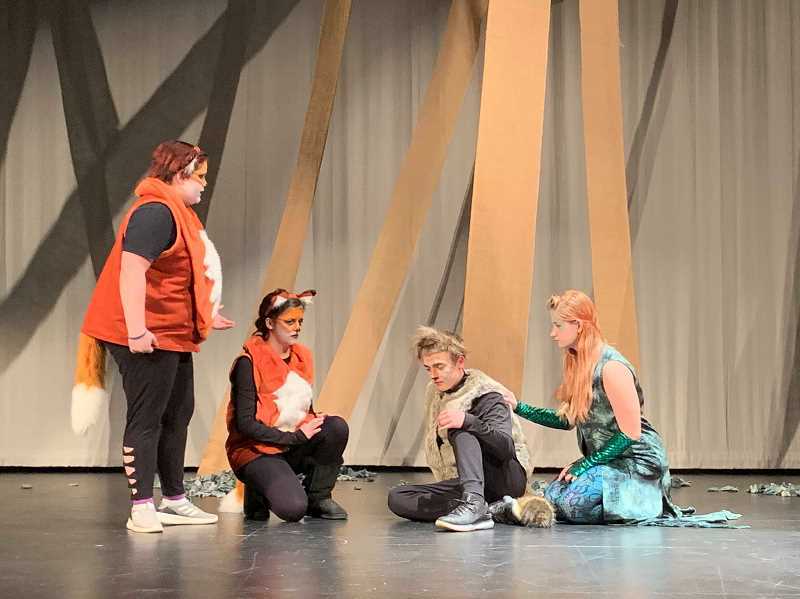 Middle and high school actors, some dressed as snakes, foxes and squirrels, stand during a recent dress rehearsal reciting their lines. Suddenly, Oliver comes on stage as the role of Beardless Joe, a recluse living in the woods, and the only human character in the production. Abby stepped in to play the part after another student dropped out, which while unplanned, became a fun experience for her, she said. "I like to be a different person and act it out on stage," Oliver said. "Beardless Joe is a great character to play. He is insane, and he breaks the fourth wall, and tells the audience he can see them. Me playing the character is ironic, because he tells the audience the characters are being controlled by a scribe, which is me because I wrote the play." Her mother, Martha Oliver, said she is excited to watch her daughter step out of her comfort zone and create something she has always dreamed about. "It is fun to see her take leadership in this, because she is really quiet," Martha Oliver said. "She did a lot of recruiting, visiting English classrooms and sent out emails. She has really worked to get others involved." Inspired by seeing her church produce a play around the children's series, "The Chronicles of Narnia," Abby Oliver set out to develop a story of her own featuring fantastical creatures. Oliver started writing her fresman year at Gaston, she said. "The Animal Parliament" took about four years to develop. After showing her screenplay to Gaston's drama director, Ellen Green, Oliver was encouraged her to get the play read by the school board for it to be approved for the big lights of the show's main stage. "I was really proud of her when she decided to go to Ellen Green and ask to put on her play," Martha Oliver said. The first step beyond finding actors was creating authentic costumes, Martha Oliver said. Because fur is an expensive fabric, the Olivers searched thrift stores for old coats to make many of the animal costumes featured in the show. "It has been fun because it is about making what we have work," Martha Oliver said. "It has come together really well." Not only are the costumes a stand out, but there is a scene Abby Oliver is particularly proud of, she said. She choreographed a fight sequence, a moment in the play she believes will capture the audience's attention, she said. "I watched videos of different animals fighting each other for inspiration," she said. "I tried to incorporate their movements in the scene." After being homeschooled and living abroad in China growing up, Oliver said she loves to attend Gaston High School and sees theater in her future after she chooses a university to attend. As for the future of "The Animal Parliament," Oliver plans to find a way to have it published professionally, she said. "The Animal Parliament" premiered Dec. 7 and runs through Dec. 15 in the Gaston's Commons Gym. Tickets cost $7 for adults and $5 for students. Dec. 14 is Senior Night, where half the proceeds of the show will benefit the senior class of 2019. Closing night, Dec. 15, is Gaston Alumni Night, encouraging drama alumni to attend.